Which Way? | ". . . let God be found true, though every man be found a liar." On the night in which the Lord was betrayed, He revealed to the eleven apostles (Judas having been dismissed from the Passover meal) that He would be leaving them. However, the Lord assured them that they would not be forgotten. In Jn. 14:1-4 He promised them that He was going away to prepare a place for them in His Father’s house, and that one day He would return to take them there. Then, He told them that they knew the way to where He was going. In v. 5 Thomas asked the question that each of them must have been thinking. He said, “Lord, we do not know where You are going, how do we know the way?” The Lord’s reply in v. 6 was simple, yet enigmatic. He said, “I am the way, and the truth, and the life; no one comes to the Father but through Me.” This could not have been the answer the apostles expected. They were still expecting the Lord to establish an earthly kingdom so they may have thought He was going to some wilderness place to which they had never been. An earthly kingdom of the type they anticipated was never the Lord’s plan, though. His was and remains a spiritual kingdom. During His ministry on the earth the Lord revealed that His miraculous works showed that the kingdom of God had come upon mankind (Mt. 12:28). Nevertheless, we don’t enter the kingdom in the same way that we catch the flu. Although the kingdom is all around us, we still need directions in order to enter it. This prompts us to ask a question which is very much like the one the apostles asked at the Passover meal in Jn. 14. If we truly wish to enter the kingdom we must ask, “Which way must we go?” The answer the Lord gave that night is still the correct, and only, answer. The Lord is the way to the kingdom of God, but what does this actually mean? How can we know that we are going the right way? In the Sermon on the Mount the Lord gave the first indication of which way we must go in order to reach the eternal reward. In Mt. 7:13-14 He said, “Enter through the narrow gate; for the gate is wide and the way is broad that leads to destruction, and there are many who enter through it. For the gate is small and the way is narrow that leads to life, and there are few who find it.” This, like the Lord’s statement in Jn. 14:6, seems to be a simple declaration, but He had something very particular in mind by both of these statements. To follow Jesus, the way, and to enter the narrow gate, means to obey His commands. This is the most basic factor in our quest to enter the kingdom and to receive eternal life. On the night of His betrayal, shortly after telling the eleven that He is the way, the Lord said, “If you love Me, you will keep My commandments” (Jn. 14:15). This was not something new, for He had emphasized this much earlier in His ministry. In Luke’s record of the Sermon on the Mount he included a statement not found in Matthew’s account. In Lk. 6:46 the Lord asked, “Why do you call Me, ‘Lord, Lord,’ and not do what I say?” He then followed with the parable of the wise and foolish builders. His point was that we will only be blessed by God if we obey the things which His Son commands us. This is a timeless truth that is, sadly, lost on many today. Nearly 600 years before the birth of our Lord, Jeremiah said, “I know, O Lord, that a man’s way is not in himself, nor is it in a man who walks to direct his steps” (Jer. 10:23). This is as true today as it was then. 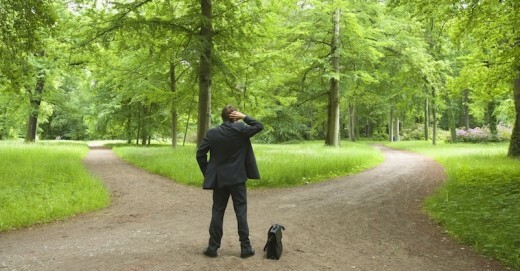 Therefore, it is incumbent upon us to ask, “Which way?”, as we travel down the pathway of life. Then, having received the answer, “I am the way,” let us follow the Lord by obeying everything He commands us.